TNI Bureau: The beleaguered Congress, which was trailing in terms of preparations for Bijepur Bypoll, has finally decided to go aggressive following a high-level meeting in Bhubaneswar today. While Leader of Opposition Narasingha Mishra will lead the charge, Jharsuguda MLA Naba Das will the Campaign Committee Coordinator. 4 former PCC Chiefs will be in charge of 1 NAC and 3 Blocks. 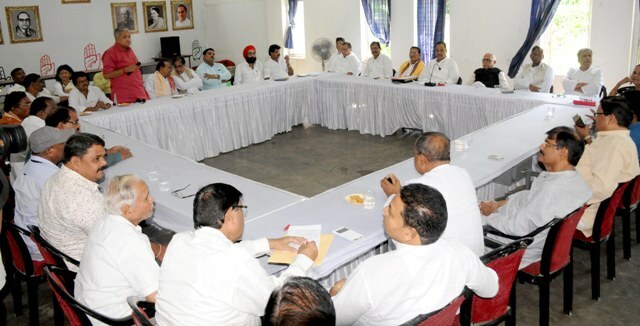 Senior Congress leaders will oversee the campaign in each panchayat. Former CM Hemananda Biswal will also play an important role in Bijepur poll campaign. Congress is confident of retaining Bijepur seat, which they held for three consecutive terms despite the fact that late MLA Subal Sahu’s wife Rita Sahu has joined the BJD and has been given a ticket from this assembly constituency.